The layer of tissue just under the skin in your palm, the fascia, has become abnormal. The fascia has formed a band which is thicker than normal and is shortened. The band prevents you fully straightening your finger. 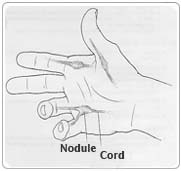 This is known as Dupuytren's contracture. It is a condition that is common in adults. Both Ronald Reagan and Margaret Thatcher had operations for it! Most people develop it for no obvious reason. However, it is more frequent among older men, diabetics, alcoholics, and heavy smokers as well as among people suffering from seizures (epilepsy) who are treated with medications called phenytoins. It can also be hereditary. The operation to correct the skin and fascia in your palm is called a palmar fasciectomy. If you have a general anaesthetic, you will be asleep for the whole operation. A cut is made along your palm and a zigzag cut up your finger. The abnormal band of skin in your palm is cut out and the rest of the normal skin in your palm is left behind. The skin wound is then closed up with stitches. Sometimes a fine plastic drainage tube is led from the wound. The operation can either be done as a day case, which means that you come into hospital on the day of the operation and go home the same day, or as an inpatient case, which means you will be in hospital one night after the operation. If your operation is done as a day case you can be given a local or a general anaesthetic. The choice depends partly on which you prefer, and partly on your anaesthetist and surgeon. Having a local anaesthetic means that you will be awake during the operation, but will not feel any pain in your hand since the area of the operation will be numbed with an anaesthetic injection. If your knuckle joint is bent with the contracture, the surgeon can usually get it straight. If your finger joint is bent, he often cannot get it to fully straighten. Afterwards, it is usually half as bent as it was before the operation. If you leave things as they are, the thickening and shortening will probably slowly get worse. If you can lay your hand completely flat on a table top, an operation is not recommended. Not all bands develop to need surgery. If you cannot straighten your finger then an operation is best. Stretching exercises are not helpful. Injections do not help. Bigger operations do not give better results. Your hand will be wrapped in a bulky bandage. Your arm will be raised up on a pillow or in a roller towel to prevent the hand swelling. The wound may be a little sore. You will be given injections or tablets to control this. Ask for more if the pain is gets worse . Your arm may be put in a sling. A general anaesthetic will make you slow, clumsy and forgetful for about 24 hours. The nurses will help you with everything you need until you can do things for yourself. Do not make important decisions, drive a car, use machinery, or even boil a kettle during that time. If your operation is a day case, you should feel fit enough to go home after an hour or two on the ward after the operation. If a wound drain has been put in, a nurse will take it out after 24 hours or so. Your stitches will be taken out after 10 days. Wash around the dressing for the first 10 days. You can wash the wound as soon as the dressing has been removed. Soap and warm tap water are entirely adequate. Salted water is not necessary. You can shower or take a bath as often as you like. You will be seen for a check-up about one or two weeks after you leave hospital. The nurses will advise about sick notes, certificates etc. You may be made a splint for your hand by the occupational therapist. You cannot drive until your stitches have been removed. Your hand may be too sore to hold a steering wheel for a further two weeks after your stitches have been removed. This depends on the extent of your surgery. How soon you can return to work depends on your job. If you can work mainly one handed, you may be able to return to work 10 days after the operation. This also depends on you being able to get to work. If your job is manual you will be unable to work for three to six weeks. You may play sport four weeks after the operation. Your hand will continue to improve for three or four months. Wound infection sometimes happens. . This can usually be settled by taking antibiotics for a few days. After the release of a severe contracture, a small area of skin may die. The surrounding skin grows in and replaces the lost skin. As a result the wound needs repeated dressings for up to six weeks. The nerves that supply feeling to the fingers run extremely close to where your surgery is performed. Occasionally a nerve may be bruised or stretched during the operation. This temporarily stops the nerve working. This gives you tingling or numbness in your finger. Occasionally, a nerve to a finger is cut. If this happens, part of your finger is completely numb. You would still be able to bend and straighten the finger. If your finger joint is bent, the surgeon often cannot get it fully straight. Very rarely, patients who also suffer from diseases like diabetes or scleroderma, which affect the blood vessels, can experience serious complications where the whole finger is affected and goes dead. This often requires removal (amputation) of the finger. Also rarely after this operation, the hand can become very stiff, painful and swollen (a complication called algodystrophy) and requires intensive long-term physiotherapy to get better.